Handcrafted counter stool. Hardwood frame. Seat fabric: polyester. Back of seat fabric: polyester/cotton. Handcrafted barstool sold individually; two shown for detail. Alder wood frame with dark-walnut finish. Polyester velvet upholstery with glass-button tufting. Peacock scarf upholstered onto back of stool combines sheer and velvet fabrics finished with beading. Handcrafted barstool sold individually; two shown for detail. Alder wood frame with dark-walnut finish. Polyester/rayon velvet upholstery on inside; polyester rosettes on outside back and arms. A cream long, curly sheepskin seat adds unbeatable pizzazz to the glamorous this stool. Handcrafted side table. 12"Dia. x 20.5"T. Brass and acrylic. 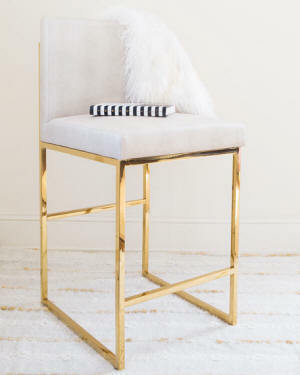 Acrylic counter stool with brass accents. Faux-shagreen cushion. A thoroughly modern iteration of classic campaign style, the black velvet barstool imbues new elegance and luxury into the straight lined cross-base design. Crafted of brass-plated steel, the barstool seat and back are made from a sensuous cotton blend. Counter height nickel stool. Iron frame and dyed sheepskin (Mongolia) fur seat cushion. The height of glamour, this Velvet Bar Stool was designed for an interior shaken, not stirred. A pairing of black velvet upholstery framed by brilliant brass, designers love its sleek, sensual style. Ideal for the modern bar or any posh entertaining area. Pearl-white, faux-shagreen counter stool. 19.5"W x 21.5"D x 40"T with 28"T seat. Welded-iron base with brass finish. Handcrafted glass tray. Accented with hand-painted 24-kt. gold rim. 14.5" x 10". Durable; chip-resistant. Dishwasher safe. Made in the USA. Counter stool with velvet upholstery. Metal frame in gold leaf finish. Fabric: polyester. Barrel back. Counter height brass stool with vinyl seat cushion. Vintage glamour gains modern presence. Stainless steel legs of satin brass shape a classic U base. Rich faux leather adopts a tobacco tone to welcome dramatic vertical channel tufting. The perfect pairing of throwback lounge style and fresh sophistication. Boasting an art modern influence, this stool features a cream leather seat and a streamlined stainless steel frame in a shiny brass finish. Leather swivel barstools will take heavy use and still look great. Leather barstools are comfortable and wear well even with daily use. Swivel leather barstools in stock for immediate shipping. Quality solid wood bar stools with leather swivel seats for optimum comfort and luxury. Swivel bar stools allow your guests to rotate to the conversation easily. Finely crafted wood finished with leather seats add an unmistakable refinement to home bars. Handcrafted barstool. Chinese oak frame; leather upholstery. Mortise-and-tenon frame construction. 360-degree full-bearing swivel. Handcrafted pub table. Oak veneer and rubberwood. Handcrafted oak barstool with Ives white gray finish and top-grain leather seat and back. 21"W x 24"D x 40"T. Seat height, 32". A classic woven bar stool gets a sophisticated update when it features mountain grey bonded leather and stainless steel with a polished nickel finish. Peruvian oak frame. Jute burlap upholstery. Natural burlap seat of woven jute. Peruvian oak frame with dark finish on turned legs; burnished golden finish framing seat. Barstool has pine frame and leather upholstery. Inspired by industrial-era functionality and style, this barstool lets you choose your comfort level. It pairs with our adjustable-height desk, and features an easy-on-the-wrist crank that lets you smoothly raise and lower the seat to suit your needs. This chic bar stool features Art Nouveau vibes that will complement traditional or contemporary design schemes. Rich black leather and antiqued brass are a classic pairing OR Dove gray leather and vintage silver are a sleek pairing. Inspired by vintage schoolhouse stools, this is the coolest seat at the bar. The mango wood and hardworking steel give it a farmhouse industrial edge, and each piece is finished by hand for a beautiful, rustic color. Handcrafted bar stool. Metal frame in chrome finish. Fabric: polyester/PVC. Handcrafted bar stool. Metal frame in brass finish. Fabric: polyester/PVC. Handcrafted counter stool. Metal frame in brass finish. Fabric: polyester/PVC. Handcrafted Boris barstool. Angular Ives white gray oak frame accented with off white viscose and hemp upholstery. Striking low-set back and comfy, deeply padded seat. Crafted with tongue-and-groove joints for strength and durability. Barstool with back. Rubberwood frame. Cotton/linen and polyester upholstery. Handcrafted bar stool. 22.5"W x 23.5"D x 36.5"T. Dark legs finished with gold leg ends and foot bar. Peruvian oak frame. Polyester upholstery. A grey velvet seat gives the sensual acrylic Corin Bar Stool a luxe vibe. Handcrafted acrylic bar stool. Quilted leather seat cushion. Metal footrest. Counter stool in linen with stainless steel frame in a brass finish. Counter stool in leather with golden frame. Handcrafted counter stool in vinyl. Welded iron frame. Handcrafted Marcy pleated-back bar stool. 19"W x 24"D x 45"T; seat, 31"T. Upholstery: Oyster is polyester. White/Black and Pewter are polyester, viscose, and polyamide. Solid pine frame. Handcrafted stainless steel dessert cart. Wrapped in Visetos printed leather. Hand-painted details. Handcrafted bar cart. Brass-finished stainless steel frame. Three glass shelves. Handcrafted bar cart. Gmelina solids, ball caster wheels, Avodire veneer, and brass components. Handcrafted bar cart. Made of mahogany, mindi, and engineered hardwood. Antiqued-mirror inset top. Antiqued-brass gallery rail. Ferrules with casters. Handcrafted bar cart. Made of iron and marble. Three shelves. The bar cart is perfect for transporting wine, spirits and imbibing accouterments from the living room to the dining room, designers love its polished stainless steel and acrylic frame Bar cart has acrylic frame and glass shelves. Iron martini table in iron with brushed golden finish. Thick glass top. Acrylic divided landscape martini table edged in gold leaf. Martini table with cream marble top and striated nickel base. Cast aluminum. Antiqued mottled textured brass martini table. Cast aluminum. Mottled nickel plated textured martini table. Cast aluminum. Martini table featuring a sweeping curved pedestal base with carved details supports an inlaid burlap top with a lightly antiqued beluga finish. The pedestal is finished in silver white. Cast aluminum tassels hang from each corner. Antiqued brass geometric martini table with acrylic top Unexpected and unique, this Martini Table features a smoked grey oak surface supported by a stainless steel base in a polished nickel finish. Handcrafted martini table of cream and black natural stone, hand-cut and inlaid over a fiberglass frame. Stone is natural and may slightly vary by color or grain. Suitable for outdoor. Handcrafted drink table of honed marble. Includes stick-on plastic bumpers for table bottom. Handcrafted martini table. Welded metal frame. Center glass shelf. Styled like the iconic speakers + amps, this mini fridge by Marshall keeps your drinks cool and your room even cooler. Featuring 3 shelves along inner door and large bottom compartment with 3 adjustable glass shelves included to arrange however it suits your stuff! Slight angles and curved handles add finesse to this clear acrylic tray. Wildly versatile, this decorative staple can transition from day to night for easy entertaining. Handcrafted Butterfly Collection trays for tea, cocktails, and nibbles. Set of 4 with stand. Each tray, 23.75"W x 15.75"D x 27"T; stand, 21.5"W x 9.5"D x 40"T. Hand-painted butterflies framed in Courtly Stripe. Hand-painted goldtone base and stand with bamboo detail. Crafted of iron and composite materials. Inspired by classical continental forms, this bar cabinet features two chalk white finished doors pierced with acrylic filled holes arranged in graceful ovals. The illuminated interior of the cabinet includes one glass adjustable shelf. Mahogany X stretchers tie together elegant, tapered legs. An acrylic finial at the intersection of the stretchers completes the silhouette. An Art Deco-inspired repeating wave design decorates the front of this bar cabinet. The interior is fitted with two drawers on push-latch runners, a mirrored back, and two adjustable glass shelves. The doors are finished in alternating golds and antiqued beluga. The case is finished in beluga white, and the metal stand is in Aztec gold. Handcrafted bar cabinet. 40"W x 16.5"D x 38"T. Lightly distressed select hardwoods and wood composite. Flora-and-fauna fabric accents. Silver-leafed moldings. Two tray drawers with roller side guides. Adjustable wood wine bottle rack/shelf. Stemware rack. Featuring an ornately decorative and strikingly graphic inlaid peacock motif, this gorgeous cabinet features a jet-black interior and a delicate, brushed brass frame. The case in American black walnut is finished in Windsor black with a gold interior. Aztec gold detailing surrounds the tiza gesso door fronts and drawer. Both the door and drawer have agate handles. The angular, boldly sized Gaspard Bar Cabinet becomes surprisingly warm and organic thanks to its gorgeous, sisal-wrapped texture. Handcrafted bar cabinet with radial pattern. Two wood and three glass shelves, all removable and adjustable. Antiqued brass detailing. Cerused oak.